The onslaught of the summer festival season is upon is. Get ready for crazy. For the next three months, beer fans get to enjoy the best of the best mostly in outdoor settings around town. The highlight, in my mind, is always the Oregon Brewers Festival, which happens in late July...a sort of exclamation point on Oregon Craft Beer Month. What event kicks off high season in Portland? It's hard to say. Maybe it was last weekend's Fruit Beer Festival, which attracted good crowds in an expanded venue in and around Burnside Brewing. That festival is going to continue to grow and will likely need an even larger space next year. 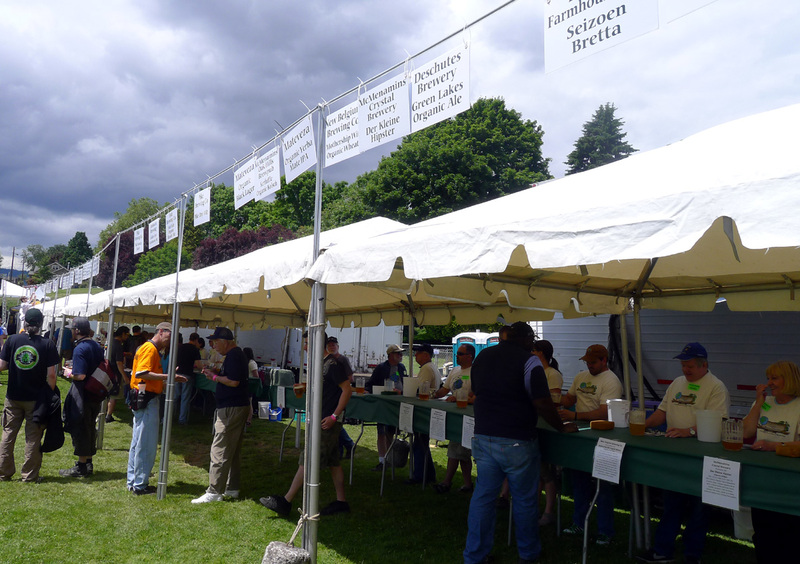 The next big event is the North American Organic Beer Festival, now in its eighth year and set for June 29-July 1 in Overlook Park. They are expecting 18,000 beer fans for what is thought to be the nation's most environmentally friendly festival. More on that shortly. They will be serving up 60 or so organic beers and ciders from 39 breweries this year. The tap list is out there to review if you're so inclined...I'll wait to make any suggestions until the week of the festival. Craig Nicholls, who is arguably Portland's first organic brewer, launched the NAOBF and continues to run the show today. Craig was the brewmaster at Alameda Brewing for many years and subsequently opened Roots Brewing. He folded up Roots a couple of years ago and has been doing consulting work since, helping folks like Fire on the Mountain organize their brewing systems and operations. Beer is sampled from reusable, compostable corn starch cups. As a direct result of the efforts made here, 90 percent of the 2,300 pounds of waste generated by the NAOBF last year avoided landfills via recycling and composting. Craig had hoped the festival would be trash neutral this year...meaning nothing would wind up in in landfills. Even if that goal is not quite attainable for now, he is focused on getting there and eventually will. As I said in an article I wrote for an actual publication last year, the NAOBF essentially uses good beer to showcase what you can do with sustainable principles if you put your mind to it. Most of the festivals around town generate mountains of waste that goes to landfills. This one does not. You have to respect that. There's plenty of information on event times and costs here. It should be another good year for the event. Mark it, dudes.